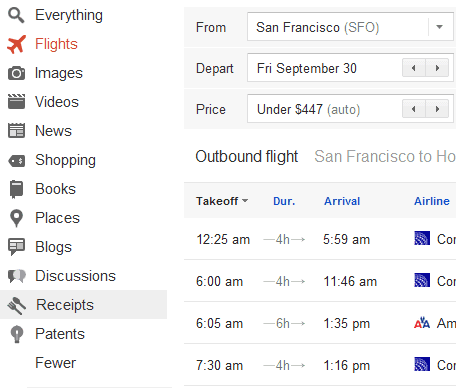 Google Flight Search has a homepage, is now included in the search sidebar and offers more options, but only for US locations. Search Engine Land reports that "this is the first product to emerge from Google's controversial acquisition of travel software company ITA, which closed in April". 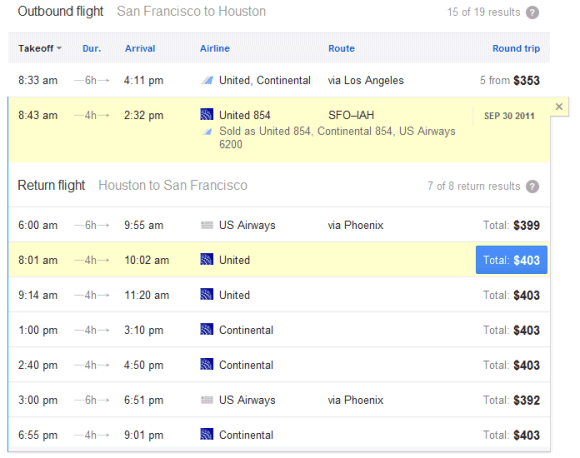 If you search for [flights from San Francisco to Houston] and choose "Flights" from the sidebar, Google shows a list of flights and lets you filter them by the number of stops, airline, outbound time, price and duration of flight. There's also a dynamic map that lets you change your destination and a smart chart for filtering long and expensive flights. Just click the "limits" button and use the sliders to customize the filters. 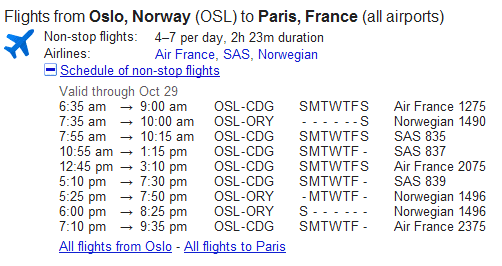 By default, Google only shows the best flights. If you click the arrows from the From or To drop-downs, you can select some of the nearby airports. You can also enter multiple locations separated by commas. 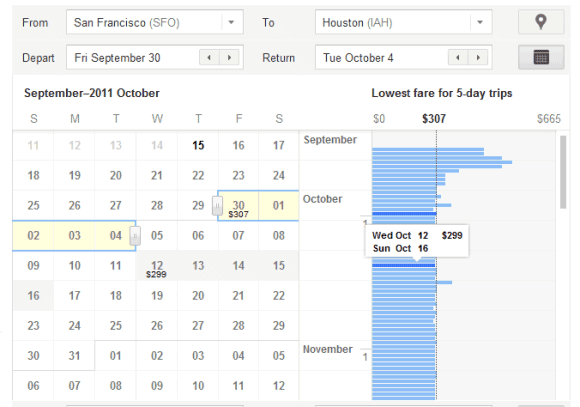 The calendar is also smart because it lets you find the cheapest flights and plan your trips accordingly. Once you've picked an outbound flight, you can also choose a return flight. Google sends you to the airline sites to book your flights, but it's interesting to notice that the links are labeled as ads. "This is just an early look: the takeoff, not the final destination! 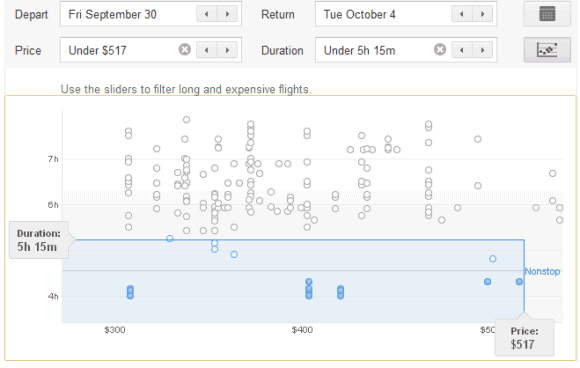 You may notice that at the moment we include a limited number of U.S. cities and show results for round-trip economy-class flights only. We're working hard to improve this feature and look forward to sharing more updates," explains Google. 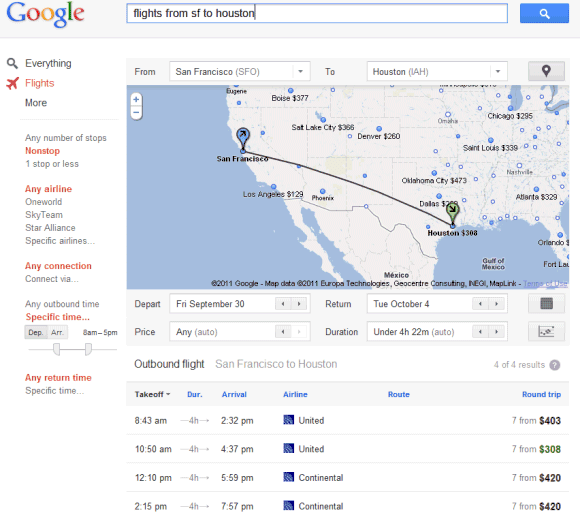 For locations outside of US, Google still shows a static OneBox with a list of flights, but this tool is not interactive. For some reason, Google shows the same OneBox if you enter US locations and doesn't link to the advanced flight search engine. Update. Philip Cunningham, an eagle-eyed reader, spotted a mistake: the link to Recipe Search is spelled "receipts" in Flight Search. Another mistake is that Google still shows icons next to the specialized search options.